We've got some fabulous new signs for our office courtesy of Signworks Signmakers, Southampton. Made out of acrylic, and mounted away from the wall, the signs look really professional. We think they contrast against and compliment the georgian buildings of the office perfectly. So if you're looking for some high quality signage for your business, we can whole heartedly recommend Signworks. Did you know you can publish your own news across the net? If you're using more than one of the very popular social media websites such as Facebook, Twitter or LinkedIn, you can download your own sharing software to spread your own news across your social media pages, with just one click! Shareaholic and Ping.fm are just two of the many sharing tools available on the internet. Spreading the word has never been such good news. All you need to do is download a sharing tool! 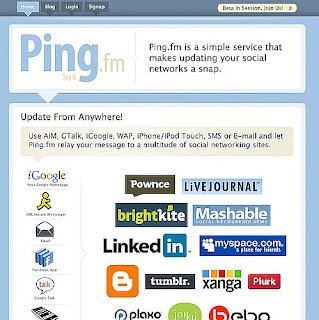 Ping.fm is a particularly popular option and works extremely well. With Ping.fm you get to make your selection from a wide choice of over 40 social media websites - so the first question to ask is which ones are you using and which ones you would like to share news on! You can create the update you would like to make in Ping.fm, press send and it will automatically display this news on all your social media pages. If you're interested in updating your social media pages with one click why not check out Ping.fm, or Firefoxes Shareaholic. If you want to see Ping in action why not check Toolkit Websites updates on LinkedIn, Twitter and Facebook and keep up with Toolkit News where ever you are!